Posted originally http://www.reviewedthebook.co.uk/2015... Eclipse is the third and final book in a fantasy trilogy which got much better as it went on. Equinox improved on a good first book but Eclipse provided an even more satisfying instalment to a creative, epic journey. The narrative in Eclipse has come full circle from where it began in Zenith, and the development of the main character Atreu is strong and plain to see. No longer is he naïve or lacking in knowledge. He’s braver and wiser and as he’s set to culminate his journey by travelling down the Mountain, he’s also ready to confront his biggest challenge yet. I finally began to believe in Atreu’s character and that made me connect with Eclipse a lot more than I had anticipated. This was an impressive way to end the series. I’m repeating myself a bit here from my reviews of the first and second book, but the level of detail the author uses in his world building is so enthralling. He really knows how to bring life to a fictional setting and so when Atreu and Verlinden are battling to save the Mountain, I can picture every vivid little element of their surroundings and what they’re facing. Eclipse really allows you to sit back and think and imagine this fantasy world until it feels almost real. It doesn’t seem to be hit with some of the weaknesses common in end-of-the-series books, where you sometimes have to suspend belief a little just to accept the way things turn out. The writing here feels accomplished, as the author combines his creativity with some believable character development and a strong story, but with that added something special to make this book feel like a ‘proper’ fantasy novel, a really, really good one. What I loved about Eclipse was that nothing was left forgotten and everything was combined and drawn out to make the trilogy feel complete, to make me appreciate every moment in each of the three books and how they all merged together to build a solid and entrancing finale. The role of Atreu working his way down the Mountain rather than up it, like in Zenith, was clever and delivered in a fascinating, tense manner. The world as it is desired was in his hands and the question of whether he could succeed in saving it was a wonderful motivator to keep me reading, to discover if Dirk Strasser had any more tricks up his sleeve and if he could make this ending top the rest. Strasser worked his magic and I was left one happy reader indeed, after the absorbing series finished on a high. *Book received in exchange for an honest review. Book Review originally published here: http://www.iheartreading.net/book-tou... Eclipse is the third and final installment in the Books of Ascension series, and it offers a satisfying ending to an interesting, thought-provoking series. Rather than going up the Mountain, this time around, Atreu, our main character, travels down. He’s miles away from the boy he was at the start of the series, and although enlightened, and with knowledge and power he never thought he had, he still has to complete one final task. Down below, at the foot of the mountain, the battle rages on, and the Nazir seem to be winning the battle, and it’s Atrue and Verlinden’s knowledge that may just save the world.In a way, this book is a reversal of what happened in the first book. Rather than travelling up the mountain in search of enlightment, Atreu, now possessing knowledge he could’ve never imagined, travels down the mountain. He’s grown from a child into a man. Eclipse also gathers all loose threads and plot points into an epic finale that outshines the previous parts of the series in terms of complexity and epicness. The scales have never been higher, the fate of the world hanging in the balance.With great writing, characters who go through such steady development readers can easily follow along on their journey, and an epic, engaging world, Dirk Strasser has weaved an intriguing fantasy series that is a must-read for all fans of epic fantasy. 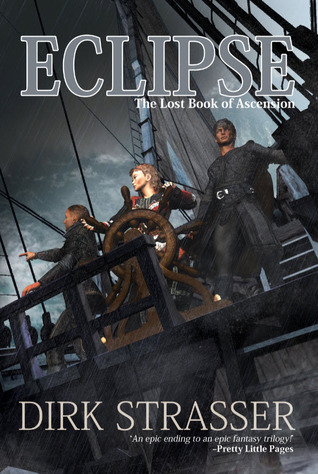 Eclipse, the final chapter of the Ascension trilogy, though only recently released in English, is a gratifying end to the series that has proved well worth the wait.In a delightfully circular manner, Eclipse very much reverses the narrative of Zenith. Now Atreu travels down the mountain rather than up, he is enlightened rather than naïve and sure of himself where once he was afraid. Where once he sought the truth of Zenith, to be taught, and to learn, now Atreu has found his own truth and become his own master.In many ways, the narrative of Eclipse feels very natural; there is a tremendous satisfaction in watching disparate plot threads draw together, and Strasser’s extensive foreshadowing pays off spectacularly.Indeed, there is a great feeling of mythic inevitability to Eclipse; so much has Strasser invested into the mythos of the Mountain and its peoples one cannot help but feel, as the last acts play out, that Strasser is not so much telling a story but relating a version of a strangely familiar legend.This is, perhaps, the greatest praise that can be given to Eclipse. It not only provides a fitting climax to the Ascension trilogy, but one that captures the essence of the series as a whole. Imbued with the same sense of wonder and majesty that permeate Zenith and Equinox, Eclipse is the ending that fans have been waiting for, and one that will delight new converts for years to come. I cannot recommend this series highly enough. An epic ending to an epic fantasy trilogy! Dirk Strasser gave an amazing ending to his series with Eclipse. Looking back on the first two books in the series, I feel like I was right alongside Atreu during his journey. His character arc made for an engaging reading experience. The pacing of this final book was effortless and showcased Strasser's skill as a fantasy writer. The play on Atreu's trek down the mountain as opposed to his trek up is incredible. I felt like the story came full circle with this ending. It was exactly what I was hoping and waiting for. After reading this trilogy, I've found myself digging through my TBR pile in search of more fantasy reads. These books have shown me why I appreciate and love fantasy so much. All of the parts of this trilogy blend so effortlessly. And this final book is the perfect culmination. This series is one that fantasy fans will adore and fly through. If you haven't discovered Dirk Strasser's The Books of Ascension series, do yourself a favor and pick them up. You'll not be disappointed. **I received this book for free in exchange for an honest review. My thanks to Enchanted Book Promotions and Dirk Strasser. I received this book in exchange for an honest review. I love how the series just kept getting better and better. This the 3rd book of the series is a dynamic ending to a wonderful series. Not all writers are able to keep the excitement and suspense on point throughout the series. Each book just kept getting better and better. The characters are well developed and maintained throughout. Awesome entertaining and thrilling ride. Katharine is a judge for the Aurealis Awards. This review is the personal opinion of Katharine herself, and does not necessarily reflect the opinion of any judging panel, the judging coordinator or the Aurealis Awards management team. I was very enthralled with this book but the ending wasn't satisfying. Dirk Strasser - Dirk Strasser has won multiple Australian Publisher Association Awards and a Ditmar for Best Professional Achievement. His mythic fantasy series, The Books of Ascension, has been republished by Macmillan Momentum, this time including Eclipse – The Lost Book of Ascension for the first time in English. His novels and short stories have been translated into a number of languages. He also founded the Aurealis Awards and has co-edited and co-published Aurealis magazine for over twenty years. Free eBooks Ssforesmart.siw.com.co Library is in no way intended to support illegal activity. We uses Search API to find the overview of books over the internet, but we don't host any files. All document files are the property of their respective owners, please respect the publisher and the author for their copyrighted creations. If you find documents that should not be here please report them. Read our DMCA Policies and Disclaimer for more details. Copyright ©2019 Free eBooks Ssforesmart.siw.com.co Library - All rights reserved.